This smart cover has been specially designed to work intelligently with your iPad 2. With its thin durable polyeurathane cover and magnetic strip. When closed it puts your ipad 2 to sleep and automatically wakes it when you open it again. You can also fold the case into a triangle and rest the iPad perfectly for typing or stand the screen upwards making it great for curling up to a film. MOVIE STAND - You can stand the ipad upright so you can enjoy your HD movies the way they should be enjoyed. FACETIME STAND - You can stand the ipad up on its side using the triangle design making facetime easier. MICROFIBRE INTERIOR - You get a microfibre interior which cleans the screen when shut, helping remove dust and grease from the everyday use of the touch screen. I love apple products, but I hate wasting money. I was sceptical about buying a smart cover from apple when I first got my iPad, since as I saw it, it was just a thin sheet of polyurethane with some magnets, surely not worth the £34.99 price tag? I ordered an executive style leather case from amazon for under £10 and felt chuffed with the bargain. 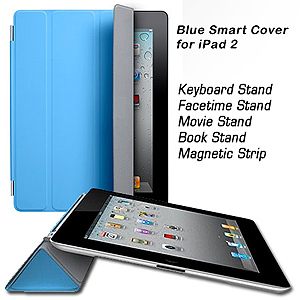 Whilst the other case was good, it didnt in anyway accentuate the features of the iPad2, its sleek profile etc. After a few weeks I found myself drawn to the smart cover and found it for a good price here! Honestly couldn't be happier with it, protects the ipad well, shows off all its best design features and functions really well as a stand too.